So, I confess that, at a time when I have not been a model blogger for months on end, I am trying to start a blog series of my own. To illustrate how slowly my blogging-wheels have been turning, I had the idea to do this over a year ago and wrote the above introduction, which is meant to recur each time I post a confession, last May. It’s been sitting in my drafts folder until I dragged it out to be today’s Just Jot It January post. And to illustrate how I am not being a model blogger, while I have been posting every day in January, thanks to Just Jot It January and a bit of a stubborn streak, I have not been following through as one should. I think I have only visited all the other blogs that posted one day this month, and a few others haphazardly here and there. With the time constraints of care-taking/daily life, I have been using my limited blogging time for writing posts and responding to comments, leaving little time for reading and commenting on others’ blogs, and for that I am very sorry. JC’s Confessions is not meant to be a bloggers-join-in series, like Linda Hill‘s Just Jot It January, One-Liner Wednesdays, or Stream of Consciousness Saturdays, although people could choose to do their own “confessions”, if they were so moved. PS In deference to today’s JusJoJan prompt, I will point out that confessions are often cathartic. Why Top of JC’s Mind? When I wrote about Just Jot It January on New Year’s Day, I said that I didn’t usually use the #JusJoJan prompts from Linda’s blog except for One-Liner Wednesdays and Stream of Consciousness Saturdays, but I decided to set aside what I had planned to post today in favor of Linda’s prompt, which was to write about your blog. What blogger would ignore the chance to write about their own blog? I started blogging after several friends suggested that I should. At the time, I was writing a lot of comments on articles about fracking as part of the fight against fracking in my home state of New York, our neighbor Pennsylvania, and in the US and around the world. I also would post on Facebook about a range of other topics, including feminism, progressive politics, and (also progressive) Catholicism. I knew I couldn’t contain myself to write about just one topic, so I decided to be eclectic and name my blog Top of JC’s Mind. I set up on WordPress in September 2013. I am not particularly tech-savvy and hadn’t really studied blogging, so I didn’t know what I was doing at first. I learned a lot from Opinionated Man and through him, connected with our beloved Linda. While never one to obsess about stats, for a while, I managed to spend a considerable amount of time on blogging – writing my own posts, reading other blogs, and writing comments. I was slowly but steadily gaining followers and enjoyed reading a number of blogs on a regular basis. Then, life happened and I wound up in maximum sandwich generation mode without much time or mind leftover for proper blogging etiquette. While I have kept Top of JC’s Mind alive over these past many months, I haven’t been able to read or comment at anywhere near the rate that I used to. I am very grateful to the stalwarts who continue to visit Top of JC’s Mind, even though I only sporadically visit them. Linda asked in her prompt for today if blogging had changed your life and I think it has. I have met and interacted with many people, both bloggers and commenters, that I would not have otherwise. It has also encouraged me to write more often and given me a platform for sharing poetry. I started blogging near the beginning of my re-engaging as a poet after not having written for decades, so the two writing disciplines have intertwined. While I think that blogging has changed my life, my life has also changed my blogging. I didn’t think I would write so often about my family, but, because that is where a lot of my heart and time reside, I have written a lot about them here at Top of JC’s Mind and also in my poetry. As the political and social divisions here in the United States have intensified over the last several years, I have tried to preserve my blog as a respectful place to exchange ideas. I don’t name-call or slam groups of people; I will, however, delete or edit comments that do because it is important to me to keep Top of JC’s Mind a civil space. I don’t delete comments if someone disagrees with me, but will dialogue in comments and use supporting links for backup, as needed, something I learned to do when I was writing commentary about fracking, renewable energy, and climate change. I admit that I get annoyed when people misunderstand science, misuse statistics, or deny facts and history, so I always try to be as accurate as possible with data and be clear when I am giving opinions. Okay. Time to do categories and tags and hit publish before January 3rd turns into January 4th. Thanks, Linda, for the opportunity. Author Joanne CoreyPosted on January 3, 2019 Categories blogging, family, Just Jot It January, musings, writingTags blog, bloggers, change, JusJoJan, life, Linda G. Hill, post, stats, Wordpress10 Comments on Why Top of JC’s Mind? Linda is once again spearheading Just Jot It January. Bloggers write a post or something every day (or as often as they can manage) and link back to her blog so we can connect with one another. There are usually prompts on Linda’s blog for those who want to use them, but I most often venture off on my own, other than Linda’s year-round One-Liner Wednesdays and Stream of Consciousness Saturdays when I will go with the flow. I have participated in Just Jot It January before, and have even managed to post every day some years. 2019 may not be my year to post every day, but I will try to post as often as I can. I hope to do some catch-up posts from 2018, as I was often too busy with my “sandwich generation” duties to get posts out. 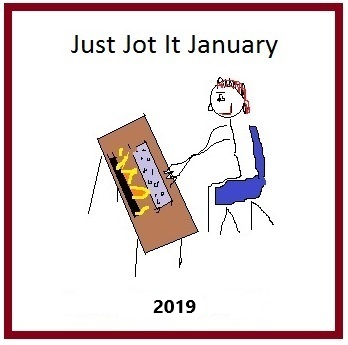 As I hope you have noticed by now, I have been participating in Linda G. Hill’s Just Jot It January, which encourages us to post daily with a pingback to Linda’s blog so we can read each other’s work and discover or revisit other blogs in the community. I have been using it as an incentive to post every day – at a time when my blogging practice remains less than optimal with most of my time and energy going toward posting and almost none toward reading and commenting. I have managed to post every day, but have only occasionally read and commented on other posts. I have been happy to find a few new blogs to follow, but I know there are others that I could have discovered if I had more time. Linda offers a prompt every day, most suggested by other bloggers who are given a shout-out for the day. They aren’t obligatory, but most people choose to follow them. Other than Linda’s continuing series, One-Liner Wednesdays and Stream of Consciousness Saturdays, I have chosen not to follow the prompts. My blog’s tagline is “eclectic, like me” so I have been writing what was on the top of my mind as I usually do. I want to thank Linda for offering Just Jot It January to the blogging community. It’s been a boost to me in the midst of a difficult month. Sending out best wishes to Linda, who brings all of us together for One-Liner Wednesday, Stream of Consciousness Saturday, and Just Jot It January and delights and entertains us with her other blog posts, fiction, and books! She had a bit of a health scare earlier in the week but was able to get to prompt care, thanks to the Canadian health care system. She is doing better, although dealing with some of the aftermath and waiting for test results to determine if further treatment is required. Let’s all send out good thoughts, prayers, and/or positive energy to Linda, who is intrepidly continuing with Just Jot It January in the midst of it all! Author Joanne CoreyPosted on January 19, 2018 Categories blogging, Just Jot It January, medical care, musings, writingTags author, blogger, Canada, care, health, JusJoJan, LIfe in Progress, Linda G. Hill3 Comments on Linda! The Magician’s Curse – Now Available for Pre-Order! Linda G. Hill, of the Life in Progress blog, through which she leads One-Liner Wednesdays, Stream of Consciousness Saturdays, Just Jot It January, and other general awesomeness, has a novel that is about to be published. 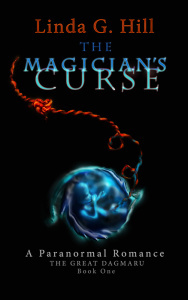 The Magician’s Curse is now available for pre-order. Check it out! Available soon on Kobo, and on June 27th in paperback on Amazon. Author Joanne CoreyPosted on June 18, 2017 June 18, 2017 Categories blogging, musings, writingTags blog, book, Gothic, Linda G. Hill, Linda Hill, novel, order, paranormal, publication, romanceLeave a comment on The Magician’s Curse – Now Available for Pre-Order!